The Dallas Cowboys defeated the New Orleans Saints, 13-10, in Week 13 of the 2018 NFL season. Dallas’ defense was fantastic, particularly in coverage, where they were consistently challenging New Orleans’ receivers and making catches difficult. And when throws were completed underneath, they were quick to the ball and made tackles for limited yardage. No surprise, but it was Leighton Vander Esch and Demarcus Lawrence who led the charge. LVE was all over the field, making stops near the line of scrimmage in both phases, while Lawrence picked up a pair of strip sacks (though one was nullified by a questionable offsides penalty). Dak Prescott‘s stat line will look good, but it certainly doesn’t explain his performance overall. The majority of his passes were short with receivers getting yards after the catch. He did have one beautifully thrown deep ball in the first quarter, but that was his only completed deep pass of the night. Twice he fumbled on sacks, the second coming late in the game where Dallas could have extended their lead. This was after missing a wide-open Michael Gallup earlier in the drive, who had torched Eli Apple on a deep stop-and-go double move and should have been an easy touchdown. Zack Martin has arguably been the best guard in football this year, but he certainly didn’t play that way in the first half. He was quickly beaten in pass protection a couple of times and allowed a few stops in the run game. He fared better in the second half, but one has to wonder how much the knee injury is affecting his play and what that will mean for the Dallas offense in the final stretch of the season. Drew Brees was kept out of rhythm throughout the night by the Dallas’ defense, uncharacteristically putting the ball in harm’s way on multiple occasions and ultimately turning in his worst performance of the season. The Saints’ offense as a whole had very little go their way on Thursday, managing to stay on the field for only 49 plays and failing to generate really any explosive plays either through the air or on the ground. Even on their lone touchdown drive, they were bailed out by multiple penalties along the way to keep the drive alive. The interior of the Saints’ defensive line played pretty well. Sheldon Rankins had a few pressures on the night and played well on a handful of plays he was in on run defense. He was outshone by David Onyemata, though, as he had three sacks on the night. Apple had one of, if not the worst, performances of his career. In the first quarter alone, he gave up a 40-yard deep pass to Gallup on top of three penalties in coverage and a missed tackle. He settled down for a while, but Gallup once again torched him late in the game on a double move that should have given Dallas a two-score lead with around six minutes to go, but he lucked out that the throw was off-target. Controlling possession of the ball and limiting the number of drives and plays the Saints’ offense had was the perfect strategy. 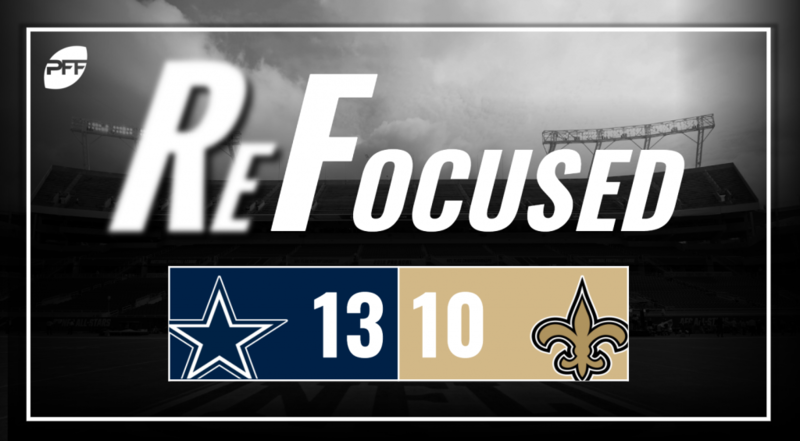 Despite only scoring three times with two being field goals, Dallas did just enough on offense thanks to their defense holding the high-powered Saints to just 10 points. One of the top offenses in football was completely and thoroughly shut down by the Cowboys’ defense.